The pointed-tip rock hammer is used mainly by geologists who are working in areas underlain by igneous and metamorphic rocks. Names given to this hammer include: pick hammer, rock picks, prospector's hammer, hard-rock hammer and pointed-tip hammer. The flat end of this tool is used for breaking rocks and light chisel work. The pointed end is used for prying rocks and prospecting in soil and loose rock debris. Always wear eye protection when using a rock hammer. Always wear eye protection when using a rock hammer or doing chisel work. These goggles have a flat lens and soft sides that conform to your face. They fit easily over most prescription glasses and have a ventilated frame for air flow. 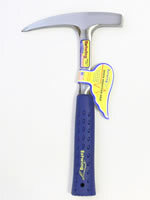 This is a light-weight rock hammer. It is much easier to control and less fatiguing than the 22-ounce hammer. It is used by young geologists; light hitters; and others who are collecting small mineral specimens, working where light hits are all that is needed, or traveling light. Length: 11". Always wear eye protection when using this tool. This hammer has a pointed tip, and carrying it in a sheath (available below) is highly recommended for safety. 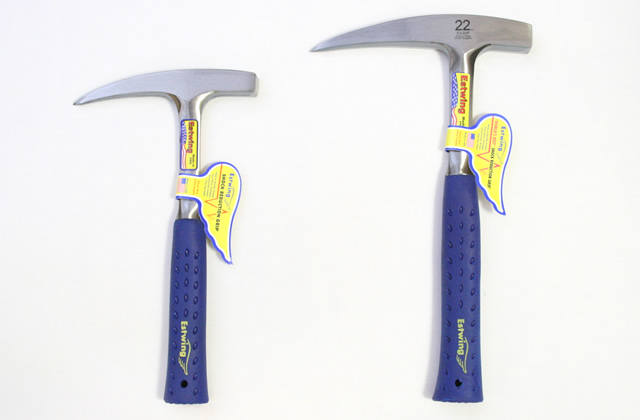 This is the standard-weight pointed-tip rock hammer and the most popular pointed-tip rock hammer that we sell. The head and handle are forged from a single piece of steel, and the soft grip is designed to reduce the vibrations of impact. Length: 13". 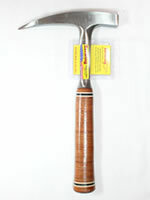 This is the standard-weight pointed-tip rock hammer. The head and handle are forged from a single piece of steel and the leather grip is designed to reduce the vibrations of impact. Lots of experienced geologists prefer the leather grip. Length: 12.5". This snap-button nylon sheath fits all of the pointed-tip rock hammers sold above. Both ends of the sheath are closed to keep the hammer head and pointed-tip covered for safety. Highly recommended for safe work in the field. A large loop allows you to easily and safely carry a hammer on your belt. It is also a good cover if you are carrying your hammer in a bag or backpack. Sheath only - hammer not included. 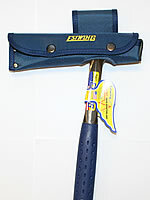 The standard rock hammer holster is designed to carry the standard rock hammers used by the field geologist. It can carry a chisel-tip hammer or a rock pick. The long leather bridge supports your hammer and keeps it straight. The bridge is large enough to accommodate leather grip, rubber grip or cushion grip hammers. The safety strap and heavy snap keep your hammer from falling out. There are two loops to fit belts up to 2" wide. The swing holster has a durable metal pivot that connects the holster to the belt loop. This enables easy adjustment of the hammer to accomodate walking, sitting, kneeling and other working postures. The pivot is loose enough to allow easy adjustment but tight enough to allow you to walk without the hammer swinging wildly. 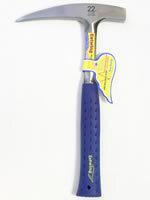 A safety strap and a lift-the-dot fastener keeps your hammer from falling out. Geologists working in the field or in a lab often need to closely examine rocks, sediments, soils and other fine-grained materials. A hand lens provides a quick and easy way to perform that work.